Come meet Santa and support a great cause! Friends of Firefighters is a non profit organization that helps and supports the FDNY community. 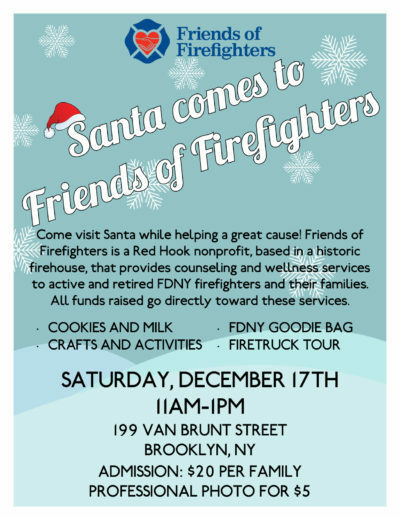 Friends of Firefighters is based out of a historic firehouse on Van Brunt Street. This Saturday, the organization is hosting a meet and greet Santa event. Families are welcome come and do some arts and crafts, tour a firetruck, have milk and cookies, and take a picture with Santa. All funds raised will support the Friends of Firefighters services. Friends of Firefighters is a 501 (c)(3) founded directly after the events of 9/11. We are dedicated to the addressing the physical, mental health, and wellness needs of NYC’s active and retired firefighters and their families. Our ongoing mission is to provide long-term support and services through confidential counseling, wellness services, and other assistance required by firefighters and their families.